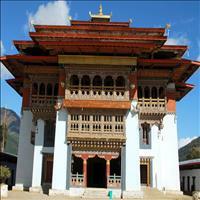 A 45-minute drive from Punakha is Wangduephodrang or Wangdi, as it&apos;&apos;s more familiarly known. The last town In the West before arriving at the Central region of Bhutan, Wangdi Is a typical small Bhutanese town, A bustling market with well-stocked shops and a pretty view over its own valley and Dzong. Wangdi is a good place to stretch your legs and wander around the shops before heading east. There are three paved roads in Wangdue Phodrang dzongkhag. The Lateral Road enters from the west at Dochu La Pass, crosses the Pana Tsang Chhu at Wangdue Phodrang dzong, and continues east to Tongsa. Located at the altitude of 4,430 feet as Punakha, it is the last western town before entering the central part of Bhutan. 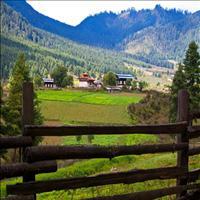 The district is known for fine bamboo work and its slate stone carvings. 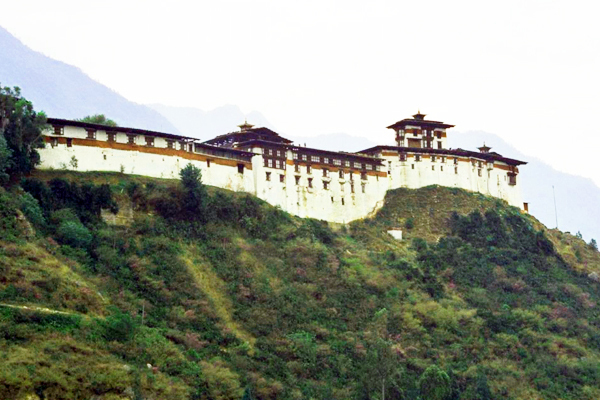 Wangduephodrang is about 4308 square kms with an elevation ranging from 800 to 5800 meters above sea level. The summers are moderately hot with cool winters. The areas in the north remain under snow during the winter and the district receives about 1000 mm of annual rainfall. 450 year old Gantey Goempa, a monastery headed by a ninth reincarnates Lama. 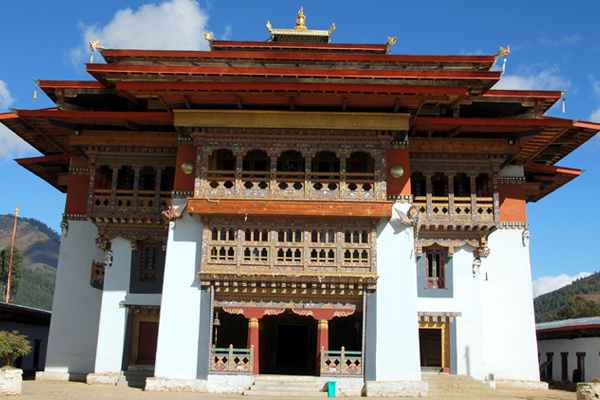 Located on top of a small hill, Gantey (gang-mountain & tey-summit) is the biggest Nyignmapa monastery in the kingdom. Situated amongst blue pines and the local village of the resident Gomchens (lay monks ), numbering over 100 they work and worship at this 16th century monastery. Founded by the grandson of Pema Lingpa (a famous Nyingmapa saint) - Pema Trinley; it is primarily the summer residence, in winter the monks and gomchen migrate south - a day’s walk away to lower altitude. With beautiful and ornate internal paintings of Mandala, the wheel of life and Zangdopelri ''paradise or the heaven of Guru Rinpoche'' and also includes a painting of the mystical land of Shambhala. A viewing inside reveals massive hand carved pillars, eight in number built in the Tibetan style, making this one of the larger prayer halls in Bhutan. Phobjikha Valley situated on the western slope of the Black Mountains, this conservation area is abundant with wildlife and a winter home to the migrating majestic black necked crane. The black necked crane is not only endangered but an inspiration for Bhutanese songs, folklores and dances. *Crane viewing mid Oct - mid March the Black necked crane is endemic to the Tibetan Plateau and adjacent regions of the Himalaya to the south and Yunnan-Guizho plateau to the east. They breed in high altitude alpine wetlands in spring and summer, and migrate to lower altitudes in autumn. Bhutan is the winter home to approx. 500 of these vulnerable creatures annually. The Phobjikha Valley is Bhutan''s largest wetland not only is it the favored winter habitat of the black necked crane it is also favored by the globally threatened white bellied Heron. The local name for the crane is ''thrung-thrung karm'' and historically it is referred to as the ‘heavenly bird'' because of their beauty, elegance and symbolism of long life & longevity. Wangduephodrang Dzong, following the contours of the hill this dramatic structure was the secondary capital of Bhutan. This ‘palace gathering all within its power'' - its name is derived from being built on a rocky spur where ravens fly off in all four directions (at the crossroads). 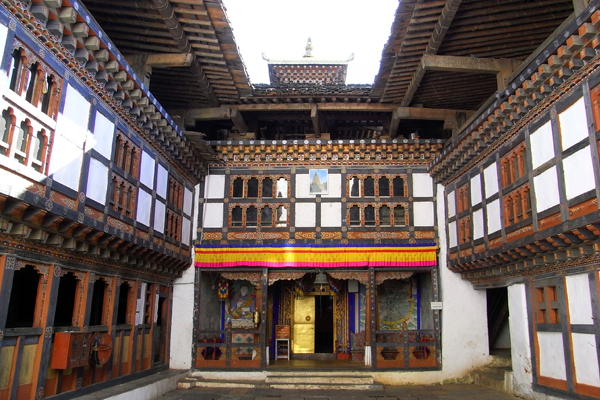 The wooden shingled monastic fortress enabled the central and eastern regions to be brought into the fold of the new Bhutanese state between 1647 and 1655. With three courtyards of varying shapes and sizes at the southern end of this rustic structure is the monk’s assembly hall which houses 3 statues of Buddha; the past, present and future.